Planter’s Punch is a fruity cocktail that’s spiked with rum. 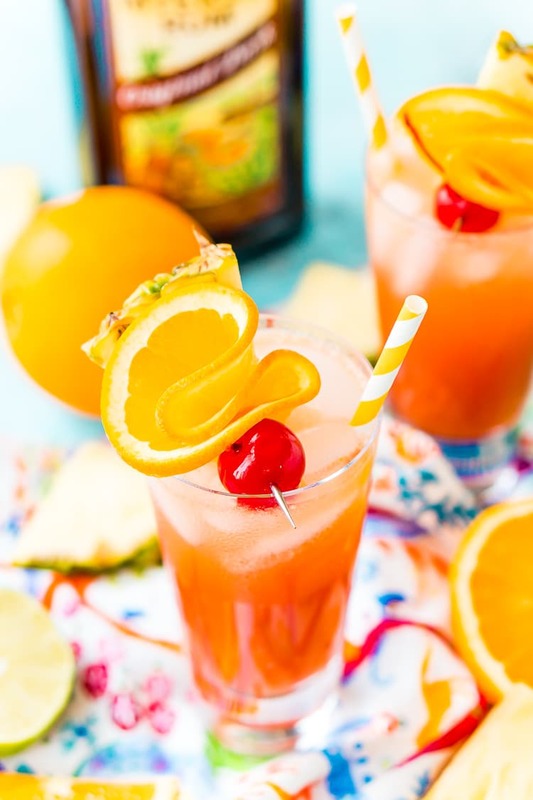 Made with orange and pineapple juices, a splash of lime, grenadine, and dark or spiced rum, this tropical mixed drink is dangerously delicious! When you’re enjoying the company of friends and family, sometimes you just want something easy to drink. If this is the case, try Planter’s Punch, a fun, fruity concoction that’s dangerously delicious. The first time I tried Planter’s Punch was on last year’s Princess Cruise, and I was blown away… I couldn’t even taste the alcohol! When I make this recipe at home, not only does it make me think of white sandy beaches and tiki huts, it takes me back to that memorable vacation! JUST TAKE ME TO THE PLANTERS PUNCH RECIPE ALREADY! 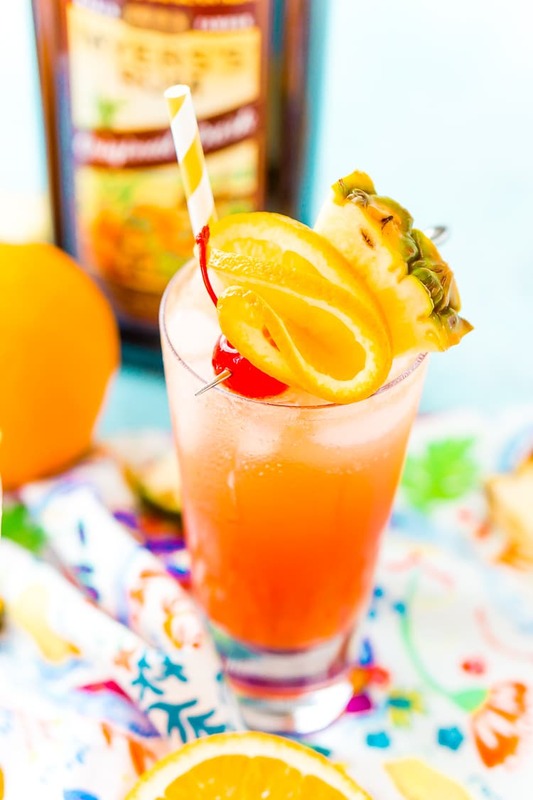 If you’d rather skip my (very helpful, I think) tips and tricks, essential cooking info, and similar recipe ideas – and get straight to this deliciously easy PLANTERS PUNCH COCKTAIL Recipe – simply scroll to the bottom of the page where you can find the printable recipe card. 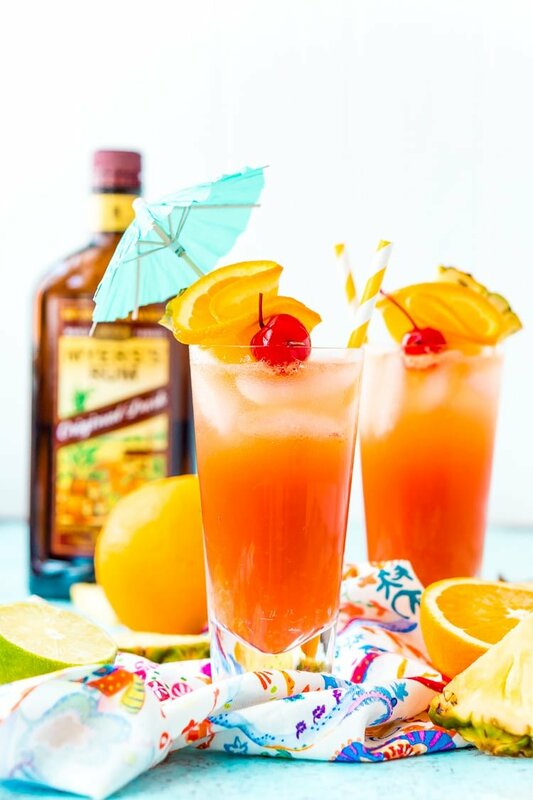 This Planter’s Punch recipe blends tropical fruit juices, fresh garnishes, and a couple shots of the good stuff! 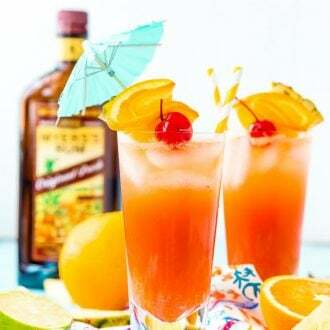 Simply mix orange and pineapple juice, a splash of lime, and grenadine with 2 ounces of dark rum. I usually use Myer’s, but any darker or spiced rum will do the trick. You can even mix rums, and for a Planter’s Punch that’s especially potent, add shots of white, amber, and dark rums to the recipe. I like to add a splash of club soda to my Planters Punch, but it’s completely optional. I just think the fizz adds a nice touch to this fruit cocktail, especially if you’re making it in large batches and serving it from a punch bowl! Don’t forget the fun garnishes! Use orange slices, pineapple slices, and maraschino cherries to decorate these island-inspired mixed drinks. Sometimes during get-togethers, I find it easiest to serve one “signature drink” instead of setting up a cocktail bar, and Planter’s Punch is easy to make in big batches. Plus, it looks gorgeous when it’s served in a glass pitcher with a spout and fresh orange slices infusing it. If the kiddos want a special drink or you or a guest are preggo like me, you can also make a non-spiked version of this punch by leaving out the rum. You might even want to add plastic swords or paper umbrellas to make the virgin versions look extra festive! 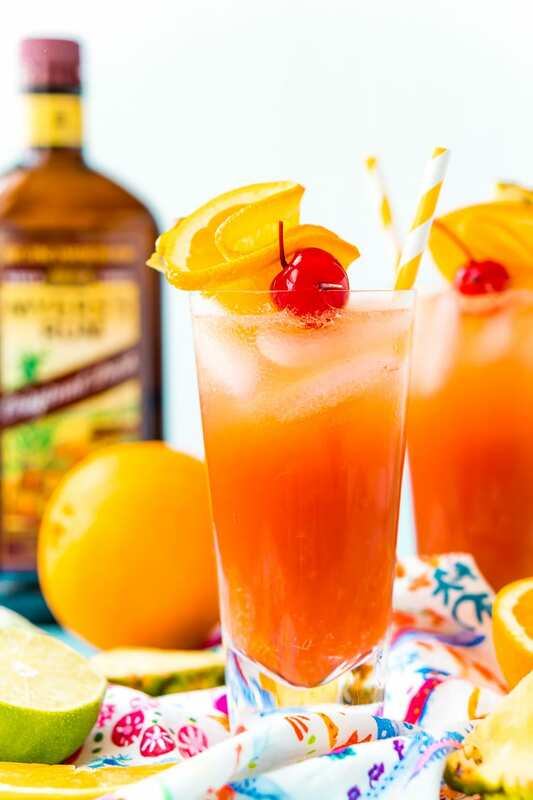 With a kick of tang and a lot of sweetness, this recipe for Planter’s Punch is perfect to sip and share with loved ones all summer long! Just be careful, because it’s so good, you’ll probably want more than one! Ice – You will want to shake the ingredients WITH ice as well as pour over ice. The reason is that this cocktail has a lot of room temperature ingredients (especially if you use fresh squeezed orange juice – YUM) and shaking it with ice will help to cool the liquid down and prevent it from melting the ice in the glass really fast. No one likes a watered down drink! Rum – The foundation of this cocktail is rum, but you can make it your own by choosing different kinds of rum. Dark Rum is the classic spirit for this recipe, but if you’d rather do a spiced or white rum, that’s fine too. A popular twist on this cocktail actually adds 1 ounce of each dark, spiced, and white to the drink for an extra strong cocktail. If you prefer coconut rum, I would actually recommend my Mai Tai cocktail instead! Punch – Originally, this post-prohibition cocktail was made as a punch, nowadays, it’s often made to order by the glass. But it’s still a very easy recipe to make in large batches, and guests will love its fruity flavors and how easy this stuff goes down! Variations – Like most punch recipes, they change over time. The original Planters Punch recipe was just rum, lime juice, sugar, and water! Feel free to play with your ratios or add sours mix or even a dash to two of Angostura bitters. You can also leave out the rum for a non-alcoholic version. Make Ahead – If you do decide to make this as a punch for a large gathering, you can definitely make it ahead, just don’t add the ice or club soda until just before serving! 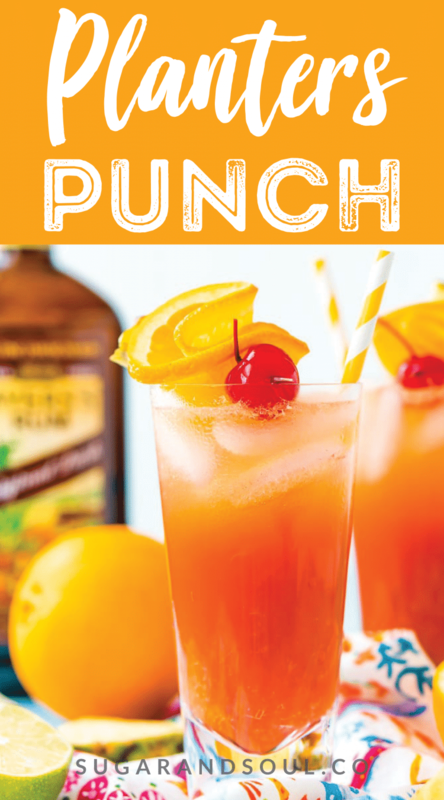 Pin this Planter’s Punch Recipe for Later! Add rum, orange juice, pineapple juice, lime juice, and grenadine to a cocktail shaker with ice and shake for 20 seconds. Fill a tall glass 3/4 of the way with ice and pour the shaker contents into the glass. Top with club soda, if desired, and garnish with orange, pineapple, and cherry. Serve with a straw. Ice - You will want to shake the ingredients WITH ice as well as pour over ice. The reason is that this cocktail has a lot of room temperature ingredients (especially if you use fresh squeezed orange juice - YUM) and shaking it with ice will help to cool the liquid down and prevent it from melting the ice in the glass really fast. No one likes a watered down drink! Rum - The foundation of this cocktail is rum, but you can make it your own by choosing different kinds of rum. Dark Rum is the classic spirit for this recipe, but if you'd rather do a spiced or white rum, that's fine too. A popular twist on this cocktail actually adds 1 ounce of each dark, spiced, and white to the drink for an extra strong cocktail. If you prefer coconut rum, I would actually recommend my Mai Tai cocktail instead! Punch - Originally, this post-prohibition cocktail was made as a punch, nowadays, it's often made to order by the glass. But it's still a very easy recipe to make in large batches, and guests will love its fruity flavors and how easy this stuff goes down! Variations - Like most punch recipes, they change over time. The original Planters Punch recipe was just rum, lime juice, sugar, and water! Feel free to play with your ratios or add sours mix or even a dash to two of Angostura bitters. Make Ahead - If you do decide to make this as a punch for a large gathering, you can definitely make it ahead, just don't add the ice or club soda until just before serving! This is one beautiful cocktail! I’ve not had a Planter’s Punch in a very long time. Thanks for the delicious recipe!! I hope it was as good as you remember! how did i miss this on the cruise??? making this weekend!!! It was my favorite of all the cocktails they offered! You’ll have to get one next time your cruise with Princess!